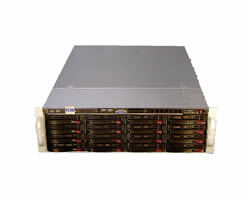 Good performance multi-function/ storage system, Special with 4 PCI-X slots, DC power input. 1 PCI-e 3.0 x8 slot (socket x8). 1 PCI-e 2.0 x1 slot. onboard 6 ports Serial ATA (SATA), 2 SATA3 (6Gb) + 4 of SATA2. (need to add controller to handle more than 6 disk drives). up to 9 USB 2.0 (Universal Serial Bus) ports -- 2x USB 3.0 ports (1 Type-A, 1 via header), 6x USB 2.0 ports (4 rear, 2 via header). 16 of 3.5" HDD bays ( w/ backplane SATA, hot-swap).